Heavy duty stainless steel wire cable for deep water down rigger trolling. Corrosion resistant for long lasting performance in both fresh and salt water. 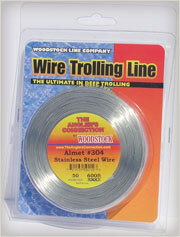 A popular trolling wire for both fresh and saltwater fishing. Bright Monel is kink resistant and has the ability to get down in deep water. Monel is soft for easy handling but high strength for landing trophy catches. This soft single strand wire is specially annealed for easy handling and maximum strength. Almet #304 has a small diameter per lb. test to fit deep water trolling reels. Great for fresh and saltwater fishing.